Pat Gorthy of Lyons recently read "They Left Us Everything," by Canadian writer Plum Johnson and will share her views of the book at the February 10, Newark Public Library Friends Luncheon. 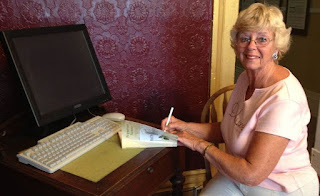 Ms. Gorthy is a retired teacher and is a regular contributor to area library and historical society functions. One reviewer describes the story as a "warmly candid memoir of navigating family, aging, and death." The writer's debut memoir tells of a daughter's struggle as she learned to cope with the houseful of mementos and memories her parents left after their deaths. Going through her parents possessions, she realized that she never really knew her free spirited, war bride mother. The February 10, 2017 book review is the last of the 2016-2017 series and will include a light lunch and desert for $5.00. Reservations are a must by February 7. Call the library at 315-331-4370. The Newark Public Library is located at 121 High Street, directly across from the Newark-Arcadia Museum. 0 Comments to ""They Left Us Everything" Book Review"